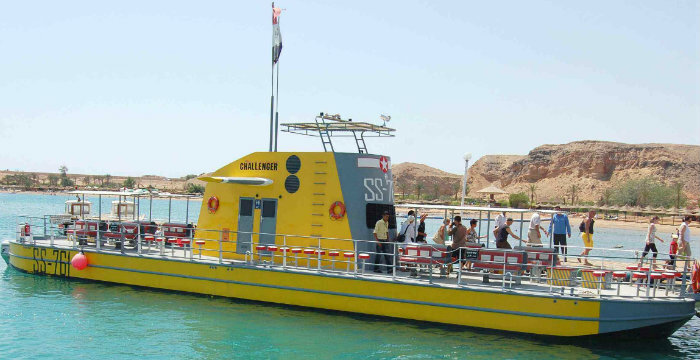 Explore the the Red Sea marine life and the underwater world in Hurghada without getting wet! Take the Sindbad Submarine for memorable underwater discovery, diving below the waves to relish the tranquility of life. You will be picked up from your hotel then transfer to the sea dock to board the SINDBAD SUBMARINE. Wander the wonderful marine life of the Red Sea aboard the unique submarine in Middle East region. It carries 44 passengers with 2 crew pilots and descends to 22 Meters depth. This trip does NOT require scuba diver or swimmer but it allows NON swimmers and kids to watch different types of coral reefs and colored fish. Return back to the surface, then to the sea dock and transfer back to hotel.